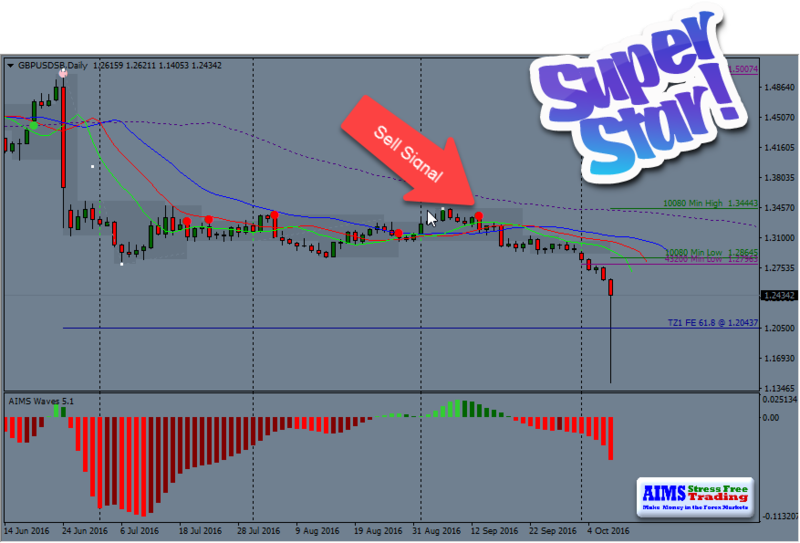 AIMS Stress Free Trading: Did you catch that flash spike on GBP/USD? Did you catch that flash spike on GBP/USD? I take no pleasure in the fact that pound is dropping however we are traders and we should be able to benefit from market moves. AIMS Stress Free Trading Strategy gave us a signal in September that it was time that pound starts to drop again. You could have taken this signal on the Daily time frame, (those who work full time) or even on the 4 and 1 hour charts for swing trading. In the picture below you see a red dot. That was a signal to consider a sell setup. After quickly checking a simple flowchart of simple rules you would have qualified this signal and taken your trade. The setup already advised where to take exits and set your target points in advance. The Entry level proposed was a few pips below 1.3043 and Target Point was 1.2043. After that all you had to do was wait for trade to trigger and boom your target point got hit on that spike. GBP/USD Great Sell Signal very good profitable trade. Trading Time Required 5 Minutes. The following trade was taken by an AIMS member. Shared picture in his journal. What a smashing trade this is , plus the add on made it a 10% winner. Fantastic return. Hardly 15 minutes of work required. And there are many more examples but you will have to SEE it to Believe it for yourself.